If you love the look of a beautifully-patterned scarf coupled with a simple white tee, faded jeans, and stylish booties, but tend to shy away from such fashion accessories and statements for fear of looking foolish, you’re not alone. Heaps of women – myself included! – don’t have the foggiest idea how to tie a scarf or how to wear ankle boots, and rather than doing a little researching and testing a couple of new looks out, they stick with old and predictable wardrobe selections. The good news is that it’s actually not that hard to teach yourself how to tie a scarf. In fact, there are more than 50 different looks you can choose from, and while some are on the complicated side, others are downright simple and have a way of transforming an otherwise boring outfit and making it into something…fabulous! I recently found a GREAT book on Amazon called 50 Ways to Wear a Scarf, which I keep in my closet to help me keep my look fresh when I’m getting dressed in the morning. And for those who are more visual and need to see something in action, I also found some AMAZING tutorials (see below!) 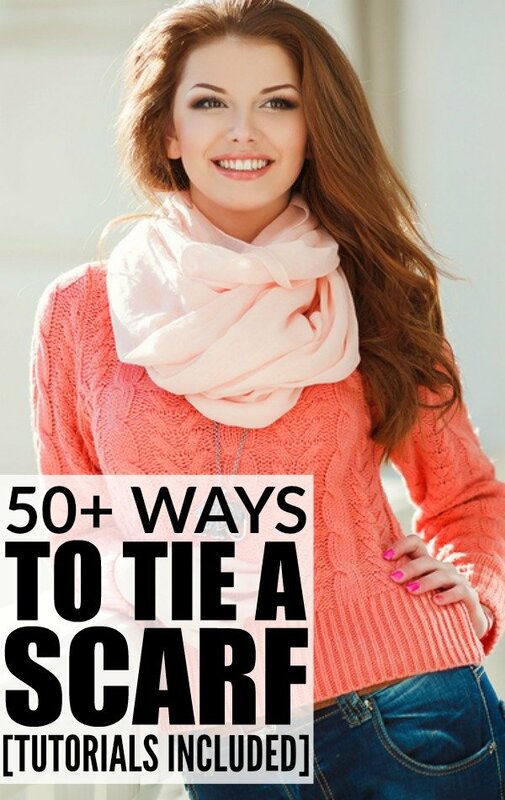 to teach you how to tie a scarf in next to no time. Oh! And check out these amazing scarves I’ve been eyeing at Nordstrom! This is one of (if not THE) best YouTube tutorials I’ve EVER watched. You are going to want to bookmark this one. Trust me! This tutorial is a bit less overwhelming with only 8 different ways to tie a scarf. I like # 7 the best. It’s easy, but different, you know?? If you’re looking for new and unique scarf-tying ideas, this tutorial is for you! My favorites from this tutorial are The Cowl Neck, The Preppy Neck Tie, The Cowgirl, and The Classy Knot, but I also love all of the swimsuit coverup ideas! If you loved the first tutorial, you will love this one, which features 25 different ways to wear silk chiffon scarves! If you loved these tutorials as much as we did, please share them on Pinterest! And if you’re looking for more beauty-related tips and tricks, please follow our Beauty board where we share all kinds of inspiration!